Sharks? Not scary. Giant sea monsters? Scary. Everyone’s saying that sharks get a lot of bad press. I think that’s true, unless you’re in the ocean staring one down and leaking blood. 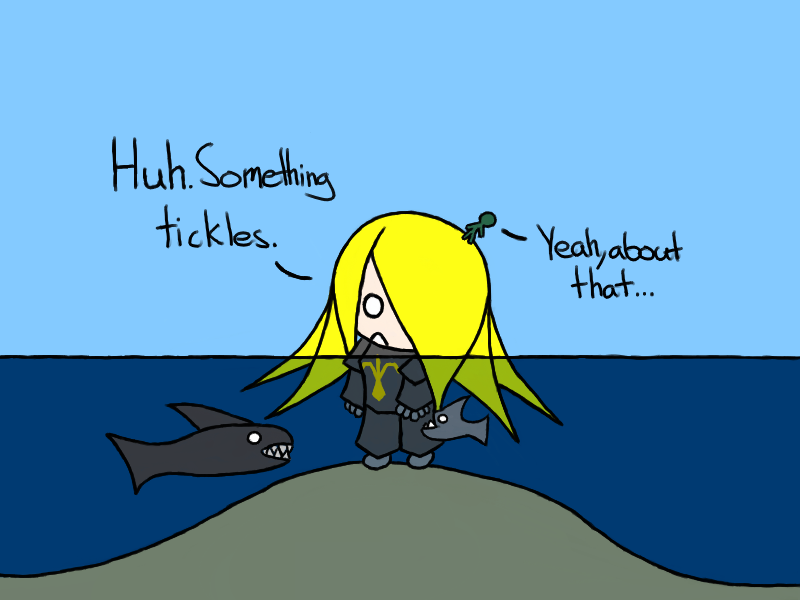 On the other hand, I’d hate to see the kind of things that lurk even deeper in the oceans. Those things give me nightmares. Who needs an aircraft carrier when you’ve got a giant head? 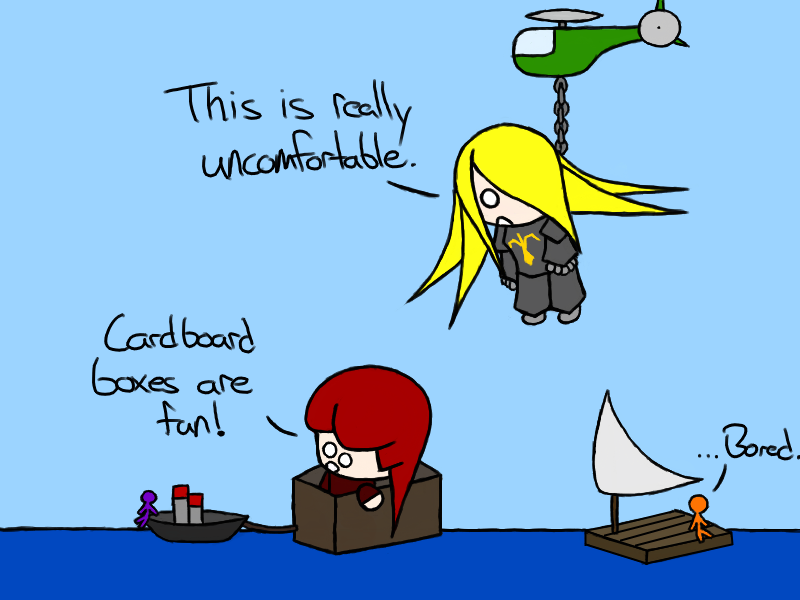 And now more of Knight and Pirate replacing technology with people! I really do wonder how much a cannon ball would hurt if it were the size the stick-people use. I imagine that it would hurt quite a bit, but the older models of cannons wouldn’t propel the cannonball hard enough to do more than bruise. A missile on the other hand would probably still vaporize parts of my face. Good to know. I can’t surf. It’s all about balance, and I have very little in my life, my body, and in my head. On the other hand Pirate could probably surf with the best. Knight and I can be the ones who get swept away. Don’t play games with Knight. Do you remember this game? I remember playing it in the pool, and I remember that diving underwater always worked best for me. That, and letting someone else get caught while you escaped. Anyways, don’t play with Knight. She’s one of those people who takes games way too seriously. This is why I don’t go swimming. And the ending to the dark waters story arc. 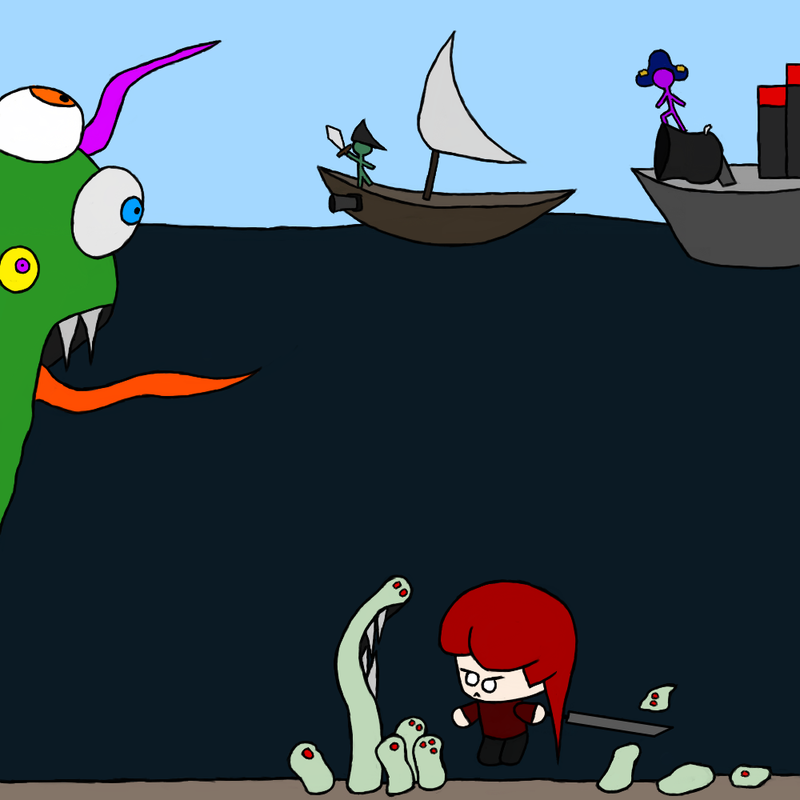 The lesson is: sea monsters are scary. I mean, how would you fight creatures underwater? Swords don’t cut that well if you’re fighting in water, and you’d need missiles and a submarine to chase those things. Me? I’d rather stay on land where I can run away. The sea doesn’t belong just to monsters! You can’t draw monsters without doing something with them. I personally sometimes despair that I can’t make things as scary as they are to me. But anyways: the green thing on the left is a creature of many eyes, your average nightmare. The oozing things on the bottom are The Hungry, which gather and feed on the unwary. What lurks in the depths? What monsters hide? 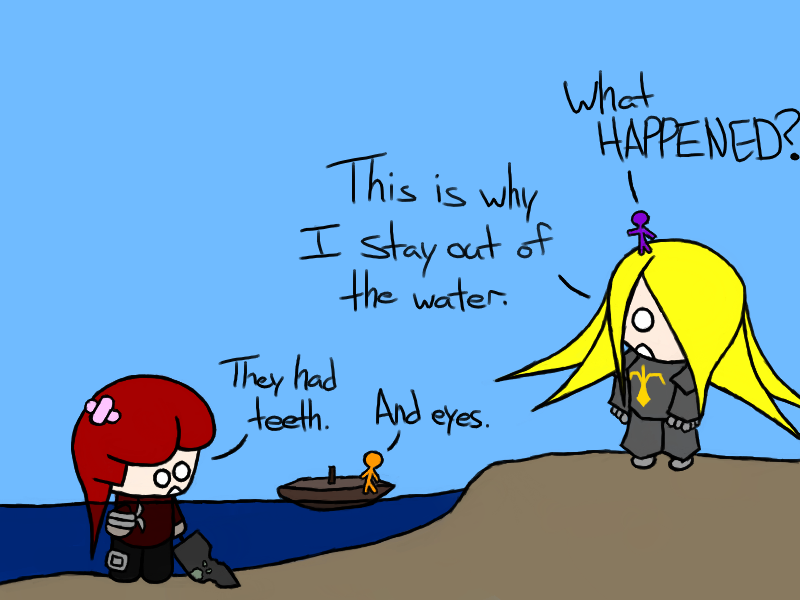 I don’t like the deep ocean. It’s not a fun place to be. If you’ve ever swum out for shore and looked down, you know what I’m talking about. 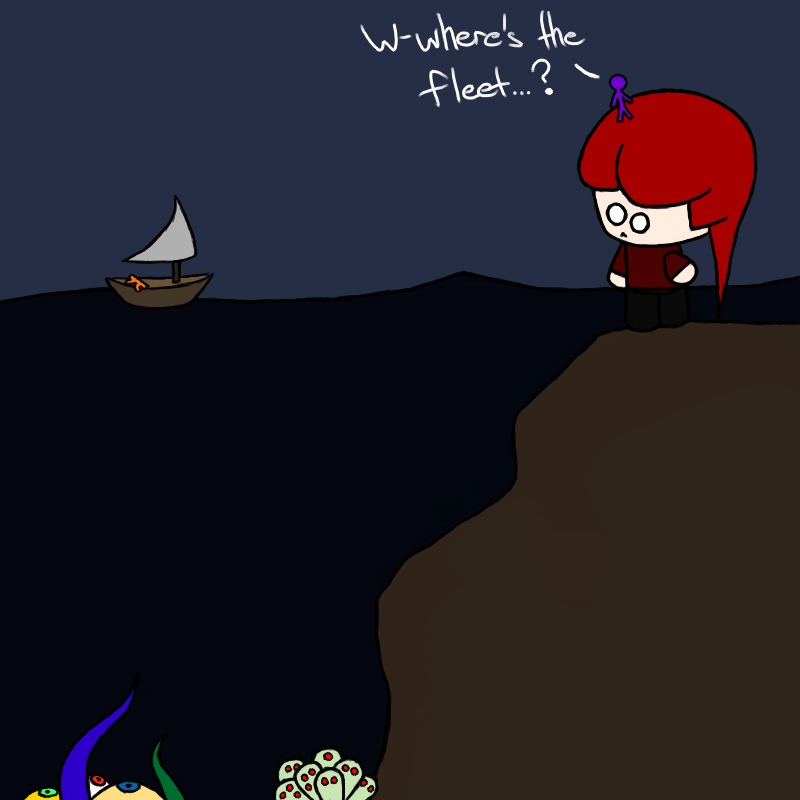 Who knows what lurks in the abyssal waters? Nightmares, I’m certain. Disclaimer: Sharks don’t actually attack people that often. You’d be better off watching out for dangerous cars. But armor helps with sharks and cars, so it’s a worthwhile investment. Just don’t sink. Plate armor. Buy it today.